Get to know Madrid’s history, starting in the 16th-century city center, with its stunning architecture and quaint ancient streets. Listen to historical anecdotes all the way up to modern-day Madrid. Go where the locals go to savor the most popular Spanish tapas in Madrid. Begin your journey through history at the center of Madrid’s Plaza Isabel II, stopping at Puerta del Sol, Plaza Mayor, and San Miguel Market. Meander along picturesque streets to Calle Segovia, the old Arab wall, the Royal Palace, and back to Plaza Isabel II. 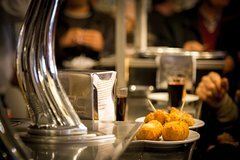 En route, you´ll stop at some of the city’s most highly-regarded family-run tapas restaurants for some tasty appetizer-sized dishes like jamón, Manchego cheese, salami and chorizo cold-cuts, Spanish tortilla, chorizo in white-wine sauce, and a traditional Castilian paella. Enjoy delicious red wine, sangría, or beer with your dishes. As is customary, you will stand up at the first three tapas bars and sit at the last, capping your meal off with some authentic chupitos, or soothing herbal shots of Pacharán or Licor de Hierbas.